Kyle Busch survived two late restarts and held off teammate Daniel Suarez. It wasnt easy sledding there at the end as they needed to have two late restarts, the last one was due to a big crash involving Bubba Wallace, he spun into the grass and ended up slamming into the inside wall, receiving heavy damage. Bubba got out of his car wabbly, grabbing hold of his bearings before being sent to the care center. 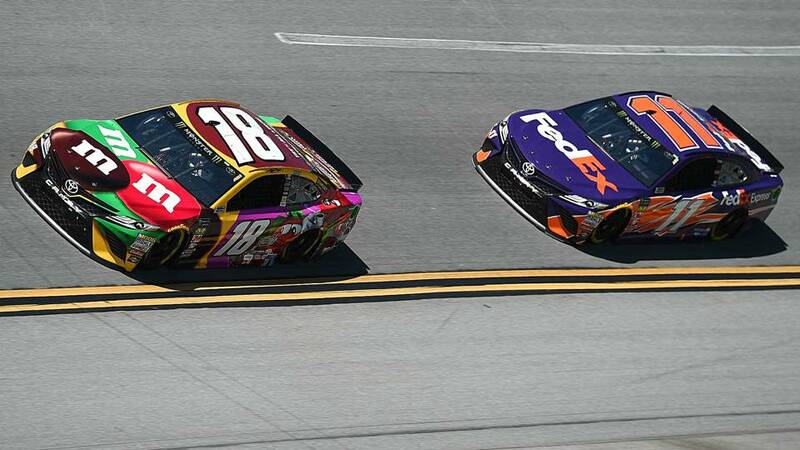 On the last restart Gibbs Teammate Daniel Suarez gave Kyle Busch all he had but needed to deal with Eric Jones on his outside, which squelched Suarez momentum, and gave Kyle Busch enough time to jump out on top and finish off the race. It was a 1-2-3 finish for Kyle Busch, Daniel Suarez, and Eric Jones. Harvick’s pole qualifying run also was erased but he still managed to make up for it, leading 30 laps and finishing in fourth place.Rounding out the Top 10 were William Byron, Chase Elliott, Ryan Newman, Kurt Busch and Denny Hamlin. A post-qualifying inspection failure knocked Busch off the front row and back to a 28th-place starting position. Although he didn’t stand on ceremony, however,charging through the field,with three laps before the end of Stage 2 allowed him to stay out under the caution at stage’s end and receive the stage win.